Smoked Grilled Cheese Rolls: Kid-Approved and Simple to Make! We have a 4-year-old daughter named Clementine. It’s rare for us to cook something on the smoker that she enjoys. She’ll eat meat, but she is picky. 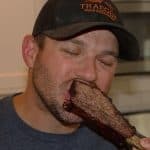 All those delicious foods we love… ribs, brisket, pulled pork… a no go with our resident food critic. One food that is a go, is grilled cheese sandwiches. A Traeger grilled cheese sandwich is delicious, but I wanted something different, that my daughter would love. 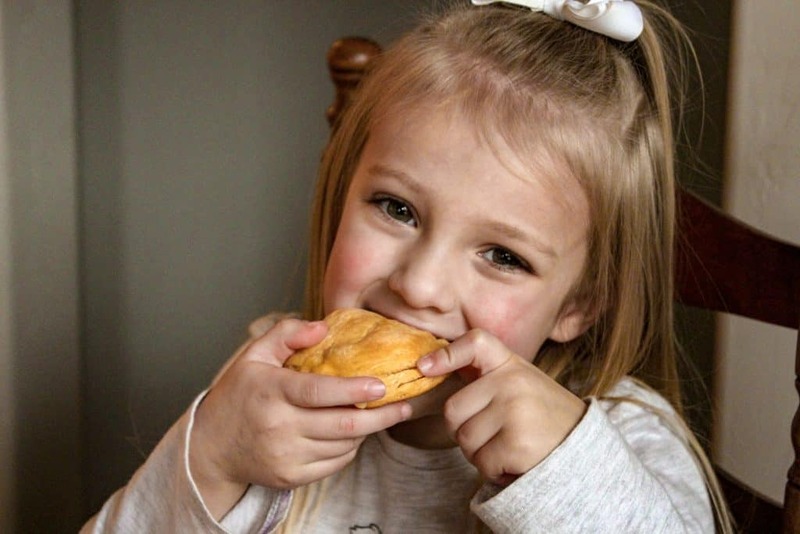 These easy to make kid-friendly smoked grilled cheese dinner rolls only took 30 minutes to make from start to finish, and Clementine loved them! 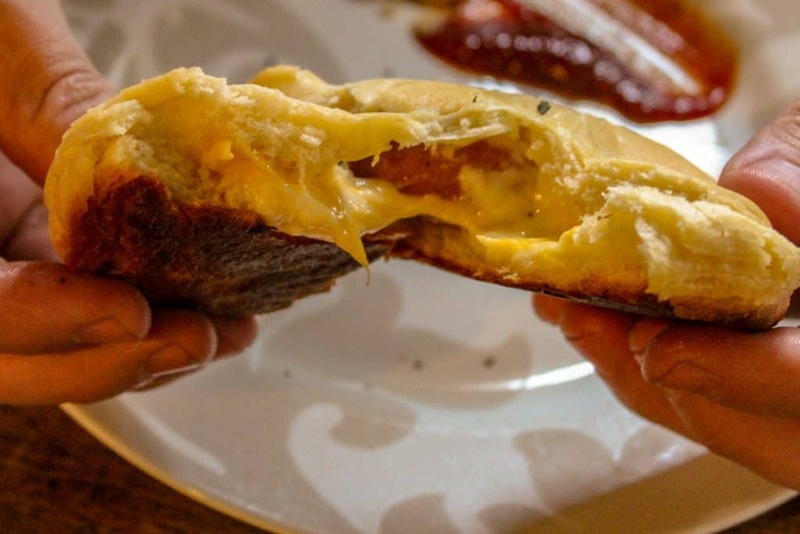 These kid-friendly smoked grilled cheese Dinner Rolls were very easy to make. If you want to get fancy, I’m sure you could make your own biscuit dough, but I just used Pillsbury Grand Biscuits for these. One package has 8 biscuits, which is more than enough for a family of 4. 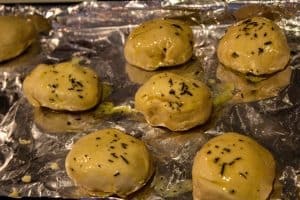 I removed each of the dinner rolls from the packaging and placed them on a foil-lined baking sheet. Then, using a butter knife, made a small slit in the side of each roll and stuffed the opening with shredded gouda and colby jack cheese. In a few of the rolls, I put a lil smoky in with the cheese blend. You can get as creative as you want with the filling. Let your kids help pick what they want in theirs! Pizza theme with marinara, mozzarella, and diced pepperoni?! Maybe a spoonful of mac and cheese with bacon crumbles? There are plenty of delicious options. Before I started stuffing each of the rolls, I turned on my Traeger, and once it started smoking, turned the temp up to 350 degrees. I placed a half a stick of butter, and some rosemary in a small dish, and placed that in the Traeger while it was coming up to temp. Pro Tip: Put a stick of butter in a small dish on the smoker to melt your butter and add some smoke flavor. It’s a small detail that can add an extra layer of flavor. Your kids might not appreciate the extra effort, but the next time you are reverse searing a steak, your wife will! By the time I was done stuffing each of the rolls, the butter had melted and the Traeger was rolling at 350 degrees. 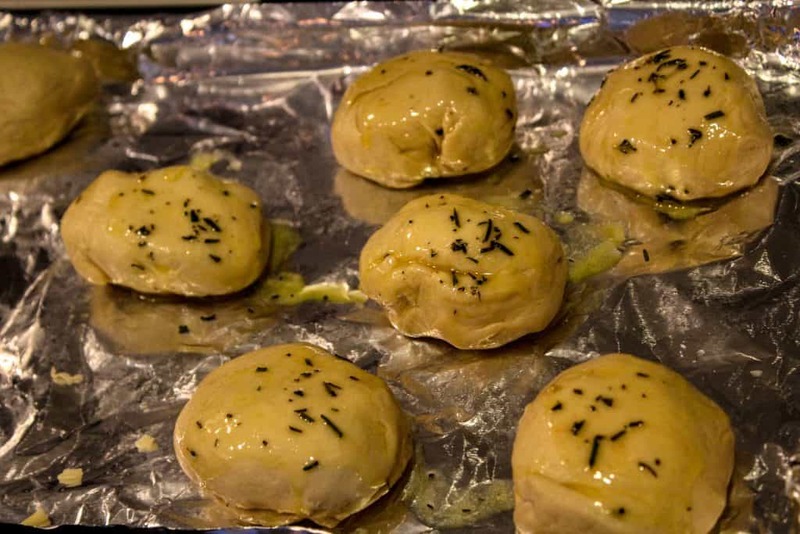 I brought the butter inside and quickly brushed each of the rolls with the mixture, and placed them on the Traeger. 15 minutes later the rolls were a golden brown, and ready to eat. Hey, that’s me! These kid-friendly Smoked Grilled Cheese rolls were really good. What healthy sides do you like to serve your kids? Let us know in the comments. If you’re looking for an easy and fun to make meal for your kids, this recipe fits the bill. 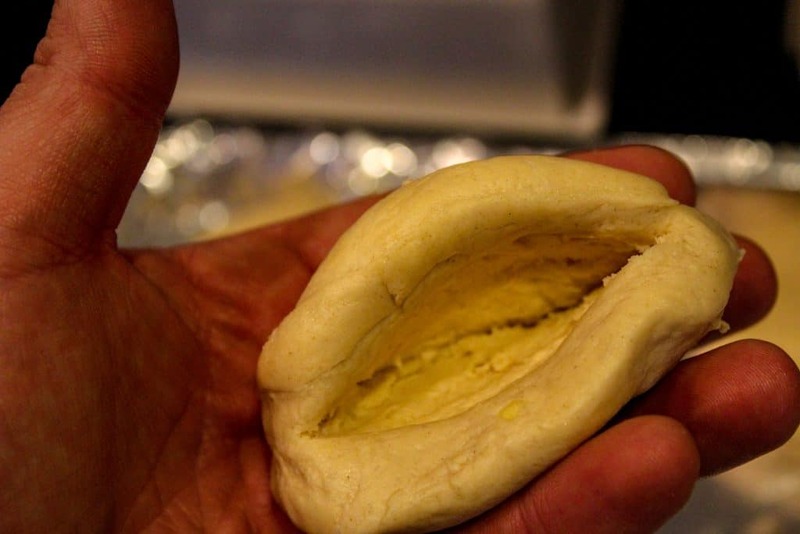 Make sure you let the rolls cool down for a few minutes before you dig in, the filling will be hot! Clementine likes to dip these stuffed grilled cheese rolls in ranch, and my preference is ketchup. 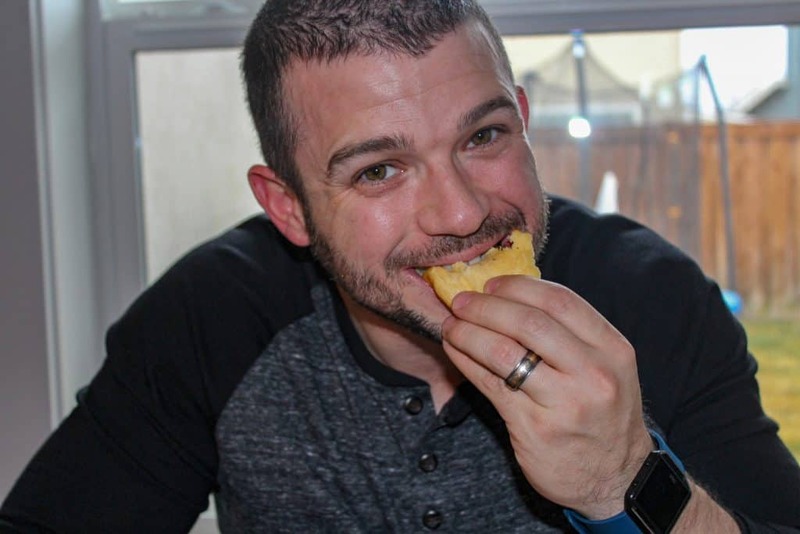 Do you dip your grilled cheese, or do you eat them plain? These kid-friendly smoked grilled cheese rolls were so easy to make on the pellet grill, and I’m sure we will be making them again soon. Don’t be afraid to experiment, and try stuffing your rolls with other cheeses and flavor combinations! Do you have any recommendations that could make this recipe better? Grilled cheese sandwiches are such a common meal, and everyone has there favorite ways to make one. What do you do? Anything you’d do differently? I’d love to hear your thoughts in the comments. Thanks for following along! I can’t wait to see what you make. 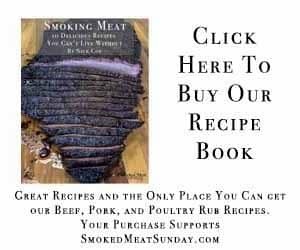 Tag @smokedmeatsunday with your creation on Instagram or use hashtag #smokedmeatsunday. 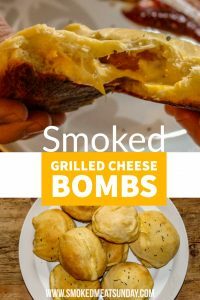 These smoked grilled cheese dinner rolls were so easy to make, and our daughter loved them! Don't be afraid to get creative with the filling and change up the flavor profile! After 20 minutes your rolls should be golden brown and ready to eat! Previous PostCan Pulled Pork Be Healthy?